Apple recently extended its trademark protection in Switzerland to include automobiles, but such filings are far from new and odds are that the company is working to cover its nascent CarPlay initiative, rather than the much-ballyhooed Apple Car. Apple applied to add protection under Nice Class 12 in February. 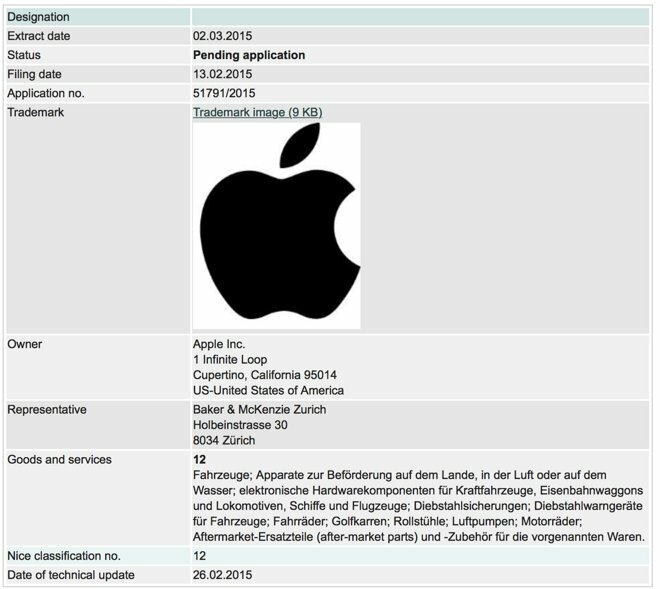 Specifically, Apple is in the process of adding Class 12 to its Swiss trademark. Under the World Intellectual Property Organization's Nice classification scheme, which standardizes trademark classifications internationally, that class includes "vehicles; apparatus for locomotion by land, air or water," and numerous associated sub-components thereof, including electronics. The timing of this move may seem suspect, given the recent appearance of Apple-operated minivans loaded down with sensors and rumors of an Apple-designed electric car, but Apple's vehicular ambitions actually go back much farther. Apple first added Class 12 to its European Union trademark in 2003. That date falls just before Apple began launching collaborations with automakers like BMW to add iPod support to in-vehicle infotainment units. In 2004, Apple filed a similar request with the U.S. Patent and Trademark Office, citing the EU declaration, though that application was eventually canceled and has yet to be renewed. Class 12 additions returned last March, with the company adding protection in New Zealand and the U.K. That's the same point at which Apple unveiled CarPlay, its latest in-car entertainment push. Apple's selected trademark classes also vary widely between jurisdictions, making it difficult to discern the company's true intent. For instance, Apple has applied for protection under Class 37 —construction services —in Hong Kong, and includes 30 classifications in its EU trademark. While Apple trademark filings have proven somewhat prescient in the past, such as the update early last year that saw it seek protection for jewelry, clocks, and watches under Class 14 in advance of the Apple Watch debut, the latest round is unlikely to be nearly so forward-thinking.